Running by yourself can be challenging. Fleet Feet Bloomington can help! In addition to our paid training programs we have several FREE opportunities to run (or walk) with others. These runs are a great way to meet people that share your interests and get in a good workout at the same time. All paces and walkers are always welcome at all of our events! Click here to join our Fleet Feet Free Fun Run Facebook group! *Please visit our Facebook group for last minute weather cancellation information. We will try to make a cancellation announcement thirty minutes prior to the start time. Join us for a free fun run & walk every Monday at 6:00 p.m! We have routes from 2 - 5 miles and all paces are welcome. We will provide a key box to store your keys, someone to watch any belongings while you're running and plenty of fluid for after the run. From April 1, 2019 to November 3, 2019 we will start from Tipton Park. We meet in the parking lot at the corner of GE and Airport Road and run on Constitution Trail. The route is 3 miles out and back to the first yellow star at the underpass at Veteran's, to the red star at Vernon is 4 and out and back to the blue star at Grandview is 5.3 miles. Please bring reflective gear as needed. After daylight savings ends in November we will move the runs to start and finish at the store so we can have a warm place to meet (and indoor restrooms!). We will run in the neighborhood East of Hershey that is a combination of sidewalks and paved roads. 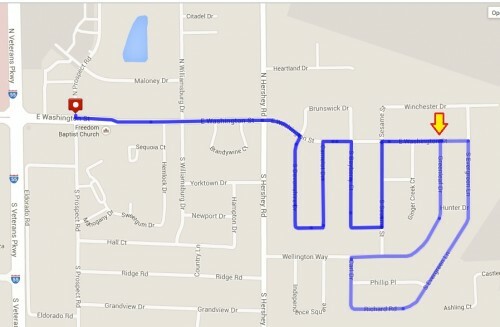 On the following map, out and back to the arrow is 3 miles, adding the loop is 4 miles and completing the loop twice is 5 miles. Please bring reflective gear and lights so you can see and be seen! Diva Night was just the beginning! Join us the THIRD Friday of every month for a ladies only night to run, walk, sip, shop and be social! We take off from the store at 6:00 pm and stay afterwards for a BYOB social until 8:00 pm. We will run the same route above for our winter runs from the store. All paces welcome! In the winter please bring reflective gear and lights so you can see and be seen. P.S. No running required! You're always welcome to join in the fun to shop or just be social! Click here to join our Fleet Feet Divas Facebook group to stay up to date on all ladies runs. Do group runs and craft beer really go together? Why, yes, they do! Join us at Lil Beaver Brewery (16 Currency Drive, Bloomington) on the last Wednesday of each month to run, walk, drink beer and socialize -- all paces and ability levels are welcome. In the winter months please bring lights and reflective gear to see and be seen. Taproom opens at 3pm and the Pub Run kicks off at 6pm. Taproom is open to the public - invite your non-runner friends and they can have your beer ready for you when you get back! 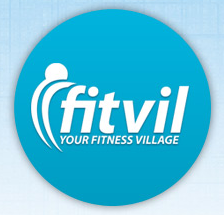 Fitvil.com is an online tool that we use to sign-up for and check-in to all of our free group fun runs and group training programs. Creating an account is free and we will never share your information. All athletes are required to sign-our waiver to participate in our runs and Fitvil makes the process easy and quick: when you show up to run you can just check in and go. We also use the program to track program attendance and will occasionally offer participation incentives and rewards.